Preeti, aged 20yrs, is the resident of Budhavarapeta, Kurnool district, AP. She was very young when her father passed away and her mother took the responsibility of raising Preeti and her two siblings by doing odd jobs. Preeti’s mother worked tirelessly to give her children basic necessities and a decent education. But over time, due to her mother’s illness and unstable income, the means to keep their household running became harder and harder. As things worsened, Preeti quit her formal education after class VII while her brother started to work at a construction site. Six months ago when things were looking bleak for her family, Preeti decided to stand up on her feet and get her family out of financial trouble. She was only class VII pass and had a hard time finding a job. She also had frequent bouts of epilepsy. After months of searching for a suitable job, she approached iCharity listed NGO SERUDS for assistance six months ago. She was on the waitlist for receipt of funds to join their skill development program. After 2 months of waiting, Preeti received a donation of Rs. 3000 from a donor through iCharity. She joined the training program to learn tailoring. After successful completion of 3 month training, Preeti was provided with a brand new sewing machine and is now utilizing her skills to sew, mend and tailor clothes in her neighborhood. 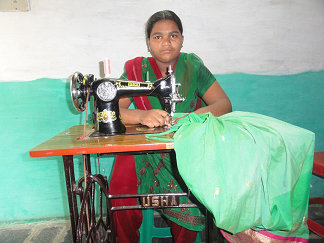 Now Preeti is a trained tailor earning more than Rs 3000 per month and is proud to support her family. She hopes to expand her business by hiring other women too. Preeti is a symbol of hope for many women who want to stand up on their feet.This is one of the many cases where one can see how a small charitable assistance with right intention can be life changing for someone in need. iCharity is proud to be facilitating many such cases.